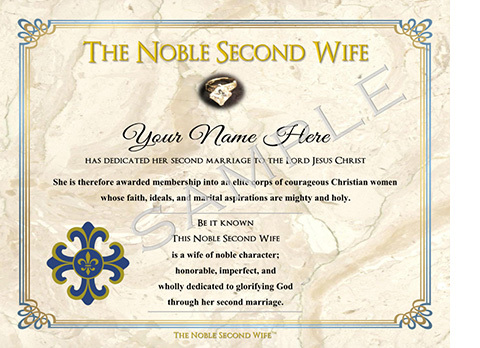 This Certificate of Honor is a beautiful way to celebrate and affirm your commitment and contribution as a Noble Second Wife. It is a daily reminder of what you believe and the importance of your worth. Visually impressive, with soft tones, it is just right for any home. It also makes a perfect gift for the Christian second wife in your family or circle of friends! Arrives in award-style cover, suitable for framing. Just provide NAME of the recipient and choose BLOCK or SCRIPT style for the recipient name.